Note: Some workshops are scheduled at Molly’s home studio in North Carolina and some are scheduled at facilities out of state. Please read descriptions carefully. Studio space with lots of light! Can accommodate up to five students! 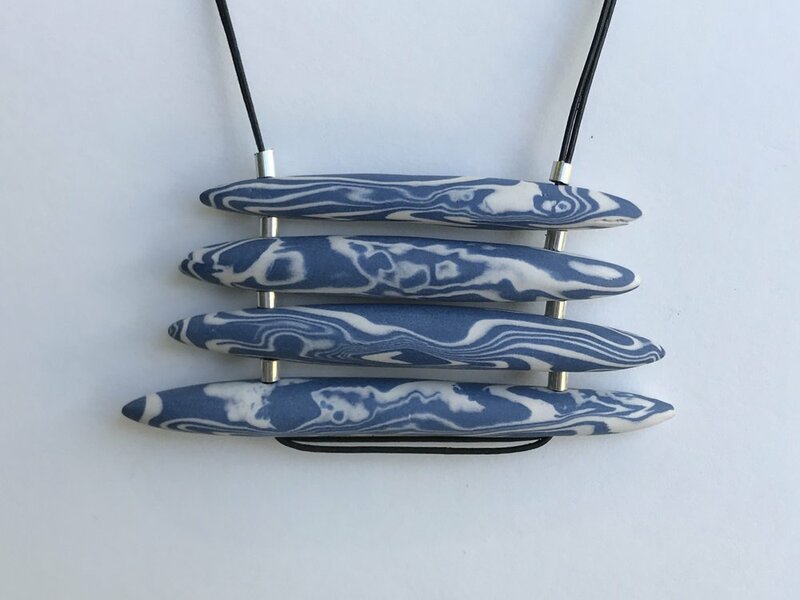 When porcelain clay meets sterling silver and sterling silver meets porcelain clay, “Silveramics” is born. Merging the respective media of clay and metal, this playful approach to jewelry making has been created by husband and wife team David Voorhees and Molly Sharp. David starts off having students “play” with the fresh, colored porcelain clay and then teaches them how to combine the colors to create marbled elements of various shapes and sizes which are then molded into pieces that are fired, sanded and tumbled into a silky smooth surface. Students will also be making an assortment of beads and have a chance to paint colored slips (very wet clay) onto other pieces which will then be scratched through with tools (Scraffito) to create patterns and designs. All these pieces get fired in a tiny kiln. While no prior experience with clay is necessary, some soldering experience is helpful but not required. Students should have good eyesight or bring magnification. $1,850 plus air fare. Room, breakfast and lunch included. Contact www.haciendamosaico.com or mollysharpvoorhees@gmail.com for more information and to register. Learn or renew your skills and techniques to fabricate sterling silver jewelry in this two-day workshop. 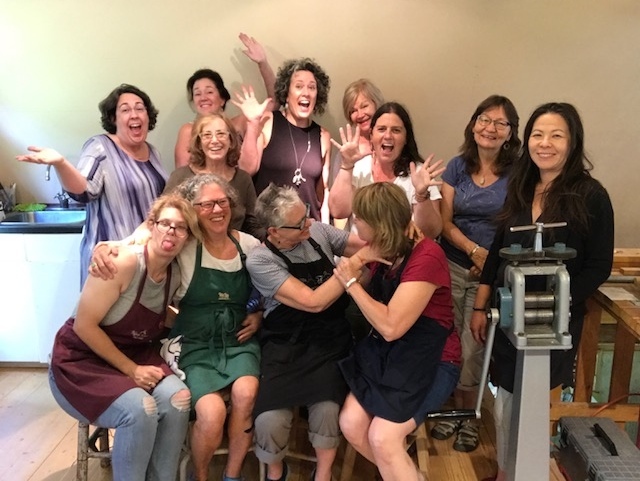 You will be taught how to saw, file, form, solder, set a stone, pierce, rivet and roller print to create at least two finished pieces (projects will vary). Little or no experience is necessary for this class, but good eyesight or magnification is a must. A $50 check is to be made out to Molly Sharp and mailed to 2212 Green River Road, Zirconia, NC 28790. Want to pay with PayPal? Find Molly at mollysharpvoorhees@gmail.com. If you have some metalsmithing experience and are ready to try your hand at working with gold, this workshop is for you. First, go through all your old or broken gold jewelry (14k or 18k only) and bring to class to melt down in a ceramic crucible. It will then be run through a rolling mill to create sheet. Each student will then fabricate a ring with their own gold, and set a cabochon stone of their choice with 22k yellow gold bezel wire. Sound like fun? Don't be afraid, just do it! Tools will be available for use. This class is limited to only eight students. Construct a unique multi-element bracelet with six diverse panels. Explore many basic metalsmithing techiques including sawing, filing, soldering, stone setting, rivets and patterning with the use of the rolling mill. Gain an introduction to pebble drilling as well as the ancient Korean technique of keum-boo. Contact Molly Sharp at mollysharpvoorhees@gmail.com to register - Limited to 8 students per each two-day workshop. A $50 non-refundable deposit is required upon registration. Using colored pencils, alcohol inks, markers, nail polish, and paint, students will learn the process to apply and retain color on copper and brass. Emphasis will also be on forming and shaping metal to create multi-layered dimensional jewelry that is beautiful, interesting and unusual. Students will begin with a blank canvas—copper sheet. We will cut it, beat on it, roll and fold it and then color it up. Each person will design a layered, dimensional pendant that will be riveted. The colored copper pieces will be combined with patterned brass to complete a layered pendant. Armed with these many techniques, students will then design a second project of their choosing. I will demonstrate pin backs, bracelet forming and riveting delicate objects (such as glass beads). Students will come away with a solid foundation of jewelry engineering, cold connections as well as coloring metal. If you have some metalsmithing experience and are ready to try your hand at working with gold, this workshop is for you. First, go through all your old or broken gold jewelry (14k or 18k only) and bring to class to melt down in a ceramic crucible. It will then be run through a rolling mill to create sheet. Each student will then fabricate a ring with their own gold and set a cabochon stone of their choice with 18k bezel wire. Sound like fune? Don't be afraid! Just do it! $300 plus a $6 lab fee and the cost of 18k bezel wire. A $100 non-refundable deposit check is to be made out to Molly Sharp and mailed to 2212 Green River Road, Zirconia, NC 28790. Want to pay with PayPal? Find Molly at mollysharpvoorhees@gmail.com. I’ve been teaching jewelry making workshops in metals for over 20 years. Word has it that I have a knack for teaching. All I know is that I love doing it! I share everything I know adding lots of tips and tricks along the way. My work is fabricated (constructed) entirely from sheet and wire and I work primarily in sterling silver but have recently started a new workshop “Working with Gold.” I love natural pebbles which I find on beaches, lakes, streams and rivers all over the U.S. and Europe. These are incorporated in many of my pieces; either set in bezels or drilled with diamond encrusted drill bits. All tools and materials will be provided or bring your own.